While three Oregon MTB XC races have been held around the state this spring, on Saturday, the Chainbreaker XC MTB Race is set to unofficially usher in the beginning of the Central Oregon mountain biking season. 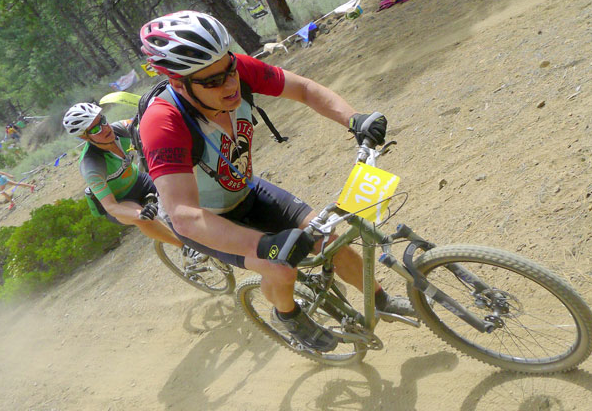 Now in its 17th year, the fun-spirited and challenging race has accumulated enough cache in the mountain biking community to draw competitors from around the Northwest, often including marquee riders. But among those out-of-towners, the Chainbreaker has always included a number of locals. "It's a course that's a little more technical, just because there are so many unexpected things," says Michelle Thorstrom, a Hutch's Bicycles employee who has raced in the Chainbreaker over the years. "There's one rock outcropping that's difficult, and you get a lot of people who push their bikes (around it) or wreck." Chainbreaker has the unique distinction as the only race that has access to Skyline Forest, private land; it is an exciting opportunity to explore trails that are otherwise off-limits throughout the rest of the year. Thorstrom says another unique aspect of the Chainbreaker is that its course features a number of steep inclines and hairpin turns, which she equates with European-style courses. And in a crowded field, that combination can result in some significant pile-ups. Compounding the omni-present danger inherent in races like the Chainbreaker is the fickle Northwest weather—Thorstrom says it's both snowed and been extraordinarily hot on race day— which could change conditions on the trails at a moment's notice. But, in spite of the fickle weather and varied terrain, the Chainbreaker race itself isn't set to undergo jarring changes, despite its management being handed over from the WebCyclery's Kevin Gorman to Bill Warburton and the Bend Endurance Academy. Marcel Russenberger, the course designer, is sticking around. And Warburton says that only a few minor alterations have occurred—connecting disparate portions of single-track trail, which removes the need for riders to navigate portions of the course that were previously roads through the forest. One other development in Bend's mountain biking scene is happening at a higher elevation. The Mt. Bachelor Bike Park opened briefly last September, but only hosted riders on five days before it snowed. The season will be much more extensive this year. On May 1, Bachelor's director of mountain operations, Tom Lomax, went out on the biking trails for the first time this year; with a Snowcat, he was trying to clear the remaining snow in preparation for the park's first full season. "Essentially, we're going to open with the footprint that we had last fall, and the potential to have Lava Flow open," he said of the system's backbone trail, a downhill enthusiast's winding dream. A portion of the Last Chance Trail, as well as the Cone Run and Blade Runner, are also set for the summer. While the entire project's expected to be completed by the end of the 2015 season, riders only need to wait until July 11 to tackle what's been finished thus far. Day passes are available, but there are also a limited number of season passes, on sale starting noon Thursday, May 8 through noon Monday, May 12; $299. or register 2 hours before the race at Skyline Forest.